Mercy Ministries is hitting the airwaves THIS Sunday to talk to real people about real life-controlling issues on SuperTalk 99.7 WTN. Over the past ten years we have seen a dramatic increase in the number of residents struggling with self-harm and eating disorders. Between 2001 and 2006 alone, the percentage of residents who reported dealing with self-harm went from 6% to 67% and those struggling with eating disorders went from 37% to 69%! For the next two weeks, starting Sunday, November 21st, NancyAlcorn and co-host Eve Annunziato will be taking calls from you, our listeners, to discuss these issues. 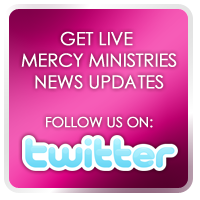 The show is called Mercy Multiplied and airs between 9:00 AM and 10:00 AM CST for the next 13 weeks. With young girls like popular teen Disney star, Demi Lovato checking herself into rehab to deal with these issues, it is clearly becoming more and more prevalent. It is estimated that one in every 200 girls between 13 – 19 years old cuts themselves regularly and 1 in 5 women struggle with an eating disorder. This all adds up to millions of hurting young women who need healing and freedom from these life-controlling issues. With over 27 years of experience and a 93% success rate, Nancy and Mercy Ministries want to share our expertise, help, and resources, as well as communicate the vision and mission of Mercy. But we need your help to get the message out. You are an important part of the show and we want to invite you to call us with your questions, stories, and comments. Together we can bring light to these life-controlling issues! Tune in to Mercy Multiplied this Sunday at 9:00 AM CST to hear more about real people, dealing with real issues, and getting real life restoration through the love of Christ. We’ll see you soon on the radio waves! To check out more about Mercy Multiplied, click here.